I love Easter. When I was a kid, it was an excuse to eat too much candy and lots of my favorite thing...HAM! As I got older I began to understand more of it's significance when it came to my beliefs but I never lost my love of ham. It's not a meat we had much growing up, it was relegated to holidays like Christmas and Easter. We would generally celebrate at my grandparents' house and I would sneak into the kitchen to "help" my grandpa carve the ham, convincing him to let me pick pieces off it to munch on before anyone else could eat it. 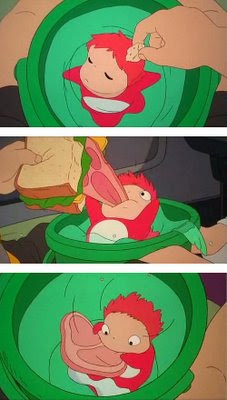 Of course, I identify with Ponyo and her love of all things ham. To this day I love ham and I found this great recipe for cooking it a few years back and tested it out on my in-laws that year. I haven't bothered finding anything new because it is amazingly delicious. Check it out in my previous post by CLICKING HERE. This year it was just my husband, my daughter (who doesn't eat ham yet at 9 months) and myself for the holiday so I made a much smaller version, but still wanted to have a special meal. I count myself lucky for finding fresh asparagus since it has been such a cold spring so far here on the East Coast! We enjoyed the aforementioned ham, a new potato recipe (below), creamy deviled eggs (also below), roasted asparagus and a new tradition: Jell-o Easter eggs. What could be more fun? This recipe for Garlic Potato Gratin is extremely simple and I found it in an issue of Food Network magazine. I just swapped sherry in for the white wine and seasoned a little heavier with the thyme, salt and pepper to make it more to our liking. It was absolutely delicious and a perfect side dish to the ham. I use Easter as an excuse to make my favorite appetizer: deviled eggs. I've tried a few recipes over the years, last year I debuted a tarragon-heavy version that was delicious, but I wanted to try a new one this year. I decided to try one of my favorite chef's recipes for Creamy Deviled Eggs and they were perfect. I might cut back on the amount of mustard next time, but I always have to tweak something! Hope your Easter dinners/lunches/brunches were delicious and you celebrated this special day with great food and family!